Stephane Rolland looks on Paris runway! There's my darling Liu Wen wearing the 2nd look! I attended Women's Fashion Week's first Press Conference quite a long while ago on 8 September and only got around to blogging it now. Yes, that's how slow I am. However, I'm pleased to announce that at least WFW hasn't began yet, though it will - very soon from 26th to 30th October. In fact, there will be a large fashion runway show held throughout various shops in Marina Bay Sands to celebrate the upcoming WFW. Unfortunately, I won't be able to go because of various school committments again. Sigh - the sad life of a full-time student in Singapore. Two renowned Haute Couture designers were flown down specially for the press conference - Gustavo Lins and Stephane Rolland. Gustavo Lins shared with us how he originally begun his higher education pursuing engineering for one year before studying architecture for 3 years, which he hated. He said that he became a fashion designer simply by chance, as he was unsatisfied with the tailor's technique that made the clothes he worn and so he wanted to tailor his own clothes. He then left his home country, Brazil, for Paris, where he learnt the specific techniques of making clothes but he had never went to fashion school. Apprenticing alongside with Jogn Galliano, Lecoanet Hemant and Jean Paul Gaultier Couture, and working alongside with a woman who used to be Balenciaga's chef d'atelier, Lins learnt how to make toile and developed a passion for fine fabrics and precise tailoring and fit. He fines an intimate connection of working with his hands - it was as though fabrics spoke to him when he touched them and that was the key for him to create, design and sculpt the fabric into certain shapes and silhouettes. It was this intimate connection that allowed Lins to create a precise silm, straight-shouldered silhouette that he is known for, but yet he does not simply create harsh tailoring but drapes his dresses so beautifully that it hangs perfectly on women's bodies. Many of his garments are reversible - beautiful on the inside as well as on the outside - and are fashioned from the most exclusive and luxurious fabrics of silk jersey, cool wool and wool crepe. 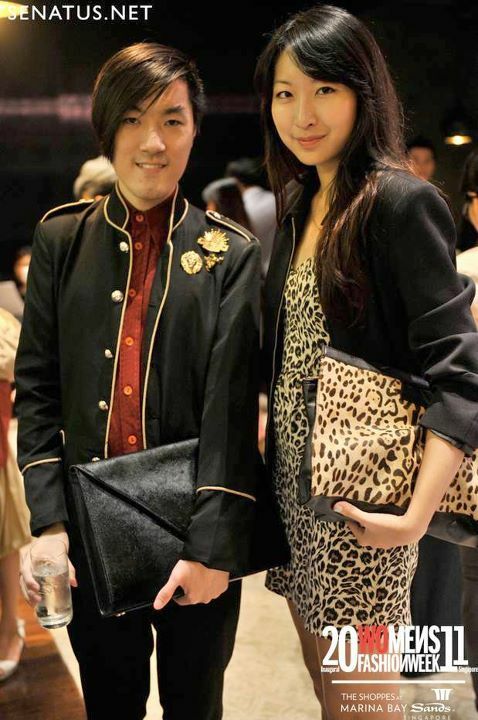 He said that upon touching down, he was very impressed by Singapore's landscape and saw it as a couture project. He observed that the trees are cut and placed in a very precise manner and he appreciates the landscape of Marina Bay. Stephane Rolland, though much younger than Lins (who is 50 this year btw), is a man of fewer words but creates such strong silhouettes and couture pieces that he is making a firm statement on how a woman should project herself and how she should dress. Having just launched his own namesake Haute Couture House on 2007, he has already been admitted to the Feration Fracaise de la Couture that was exclusive to a very small circle of only 11 haute couture houses. During the press conference, a member of the press invited from India asked him whether he would design for women with "imperfect" bodies like her. She obviously saw the fashion industry as a superficial one with designers designing beautiful garments only for beautiful people like the models that act like clothes horses during a fashion show. Of Stephane Rolland's reply, he calmly narrated a story whereby once he had a client that was rather plump, dressed in jeans to come to his couture house for a fitting without making a prior appointment after being turned down at other houses. He did it and made a couture gown for that client, who actually happened to be the princess of a Middle East country and all of her friends almost couldn't recognize her when they saw how beautiful she was in her gown. "I don't think of anyone when I design but I know I must adapt my design to different bodies. I want to project strong women and not hide their personalities." If you must know, Stephane Rolland only designs for 10 regular clients who comes for fittings, and the rest of his work goes to people who buys indirectly instead of made to measure. A gown from his house costs around 100,000 Euros. And here are some important dates to take note! Who says jewelry are women stuffs only? Even men are fashionable enough to accessorize themselves. Aside from necklaces, earring and rings, men's bracelets are becoming frequently embedded in men's fashion. Bracelets complement well with different attire, be it for formal, preppy, professional or casual and as a result it adds sophistication to men. Nice post.Thanks for sharing.To get more coupons of latest fashion products check out jabong coupons at Grabon India. beautiful-blouse-designs to get one for you also ! Great pictures. For latest and exclusive Amazon Indian coupons go to couponmama.